A team of 10 senior Australian lifesavers (volunteers) and lifeguards (professionals) will be in Phuket on Tuesday (July 18) to conduct beach safety audits, skills training and skill assessments for the Phuket Lifeguard Service (PLS). 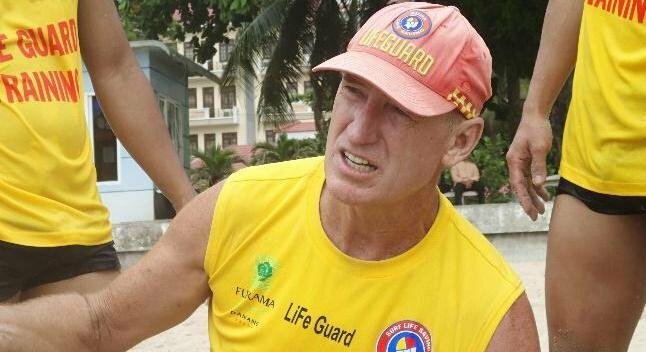 David Field will lead the tour of Phuket by expert Australian lifeguards this month. 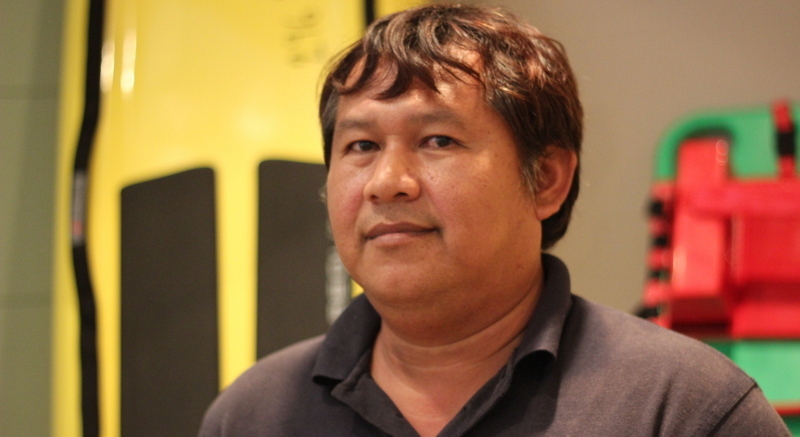 Chief of the Phuket Lifeguard Service Prathaiyut Chuayuan. In turn, the head of PLS has put out a call for all Thai people working in the tourism sector – including speedboat and jet-ski operators, tour guides and hotel staff – to take part in the rescue training exercise in order to help save lives. 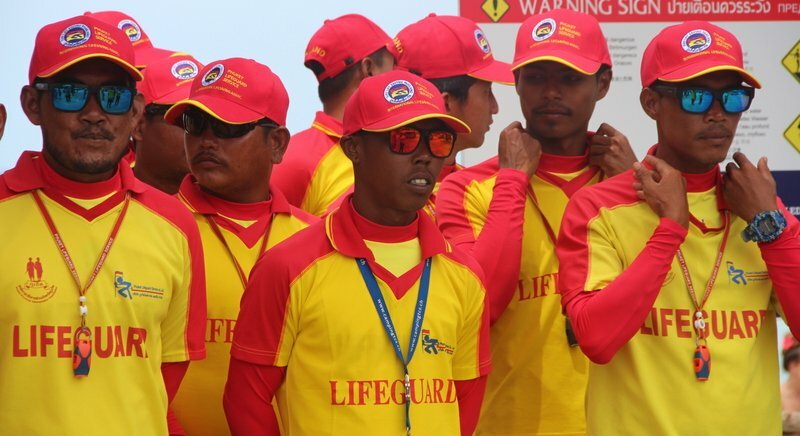 “We are so happy that they are coming to update all our staff on the latest techniques, and they usually conduct the training in a realistic way that our lifeguards enjoy,” said Chief of the PLS Prathaiyut Chuayuan. He added that the training session is an excellent opportunity for all people working in the tourism sector to improve their skills and knowledge around water safety, rescue techniques and first aid. In the 1990s Surf Life Saving Australia (SLSA) began coming to Phuket to train hotel staff and “beachguards” to patrol the island’s public beaches, and since then they have had a close relationship with their counterparts here in Phuket. Back then, Phuket’s beaches were often guarded by people untrained in beach management, ocean rescue techniques, or CPR, many were even non-swimmers and their rescue equipment was of poor quality. Today, as head of the PLS Mr Prathaiyut looks back on his days as a young lifeguard working at Le Meridien Phuket Beach Resort in Karon and reflects on how far Phuket has come. “We have learned how to bring our standards up to world standards. My managers are all Australian-trained and we have also travelled to several world lifesaving conferences and events since 2012 to increase our expertise in aquatic safety in our own right. “Last year PLS was gained membership to the International Life Saving Federation and we are very proud of this achievement,” he said. Tuesday’s training will be the sixth such training activity undertaken by SLSA in conjunction with PLS. “We are not perfect but are learning quickly,” said Mr Prathaiyut. “This August we will launch the first ever surf life-saving manual in Thai. The Australian government has helped fund this project because we identified a need for a standard approach to lifesaving training,” he added. The problems confronting the PLS as it strives for safer beaches is similar to those faced by other lifeguard services across the globe. “If people obey our lifeguards, and follow the multi-language signage and flag system used on Phuket’s beaches, there should be no problem. However, if people get drunk and take drugs before entering the sea, or swim at night, or enter the sea during high surf, then problems can and do happen,” noted Mr Prathaiyut. “We have come a long way in a short time and we are still improving. Our partnership with Surf Life Saving Australia and with individual surf clubs in Australia will only strengthen us further,” he added. This December PLS we will be holding its sixth annual Phuket Surf Carnival and this year it will be hosting Thailand’s first National Surf Life Saving Championships. The Championships form part of Phuket Swim Week, a seven-day event combining ocean swimming events with children’s water safety activities that the PLS is staging in cooperation with the Thailand Amateur Swimming Association and Australia surf life savers. “We have a strategy to use competition and water safety activities to attract people to Phuket who can enjoy the sea and contribute to better water safety for Thai people and our international visitors,” said Mr Prathaiyut. The training to be conducted by the team of Australians this month will focus on skills assessment for Phuket Lifeguards in order to gauge their rescue readiness and beach management practices. Mr Prathaiyut has invited all Thai people working in tourism who work near the water in any capacity to take part in the rescue training. People interested in joining the training can contact the PLS on 081-8925549.